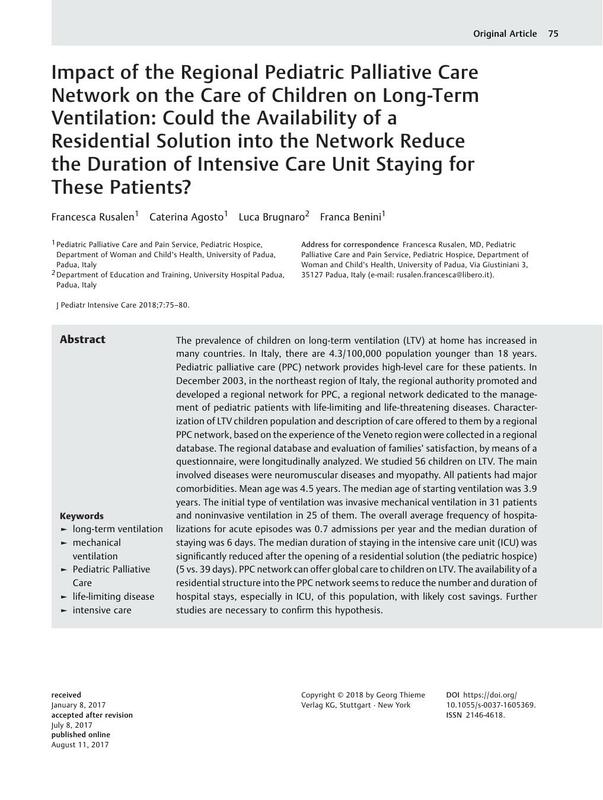 Impact of the Regional Pediatric Palliative Care Network on the Care of Children on Long-Term Ventilation: Could the Availability of a Residential Solution into the Network Reduce the Duration of Intensive Care Unit Staying for These Patients? The prevalence of children on long-term ventilation (LTV) at home has increased in many countries. In Italy, there are 4.3/100,000 population younger than 18 years. Pediatric palliative care (PPC) network provides high-level care for these patients. In December 2003, in the northeast region of Italy, the regional authority promoted and developed a regional network for PPC, a regional network dedicated to the management of pediatric patients with life-limiting and life-threatening diseases. Characterization of LTV children population and description of care offered to them by a regional PPC network, based on the experience of the Veneto region were collected in a regional database. The regional database and evaluation of families' satisfaction, by means of a questionnaire, were longitudinally analyzed. We studied 56 children on LTV. The main involved diseases were neuromuscular diseases and myopathy. All patients had major comorbidities. Mean age was 4.5 years. The median age of starting ventilation was 3.9 years. The initial type of ventilation was invasive mechanical ventilation in 31 patients and noninvasive ventilation in 25 of them. The overall average frequency of hospitalizations for acute episodes was 0.7 admissions per year and the median duration of staying was 6 days. The median duration of staying in the intensive care unit (ICU) was significantly reduced after the opening of a residential solution (the pediatric hospice) (5 vs. 39 days). PPC network can offer global care to children on LTV. The availability of a residential structure into the PPC network seems to reduce the number and duration of hospital stays, especially in ICU, of this population, with likely cost savings. Further studies are necessary to confirm this hypothesis. All procedures performed in this study, involving human participants, have been in accordance with the ethical standards of the institutional and/or national research committee and with the 1964 Helsinki declaration and its later amendments or comparable ethical standards. The study has obtained the approval of the Ethics Committee. Informed consent has been obtained from all individual participants included in the study. The study has been performed at the Pediatric Pain and Palliative Care Service, Department of Pediatrics, University of Padua, Via Giustiniani 3, 35127 Padua, Italy.